Wakizashi in Shirasaya with Koshirae.In Koshirae. Blade length(nagasa) : 47.7 cm or 18.7inches. 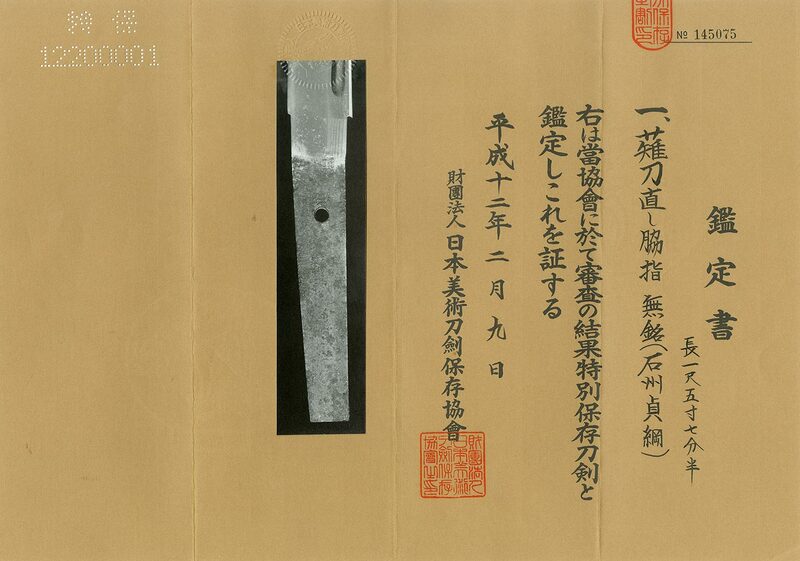 Width at the Kissaki : 2.69cm or1.05inches. Kasane : 0.56cm or 0.22inches. Era : Nanbokucyo period 1350. Shape(Sugata):The blade is regular width and thickness Naginata naoshi style . Kitae :Itame hada well grained with jinie attach and visible to see the texture. sunagashi and also kinsuji work. Boshi:In Ookissaki boshi, gunome round shape midare with sunagashi kinsuji work yakizume style. been prospered by exporting iron. Tsuba :On the round shape iron tsuba, engrave Kizami and inlay by copper plate. Menuki : On the syakudo plate, samurai good is engraveed with gold color. Fuchi:Kashira:on the syakudo nanako plate, battling samura is engraved with gold color. Kojiri:on the iron plate, chinese ancient animal is painted by gold color. From Aoi Bijyutsu:Sekisyu Sadatsuna is a student of the Naotsuna looks more gentle hamon. generally gunome midare round shape and active sosyu style temper line inside of the Hamon. The Koshiare is also nice good condition Koshirae.